Two different styles of impulse engines. The grills are also made to be placed in two different positions to provide alternative lighting affects. Bridge window frames to mask the lights. Officers lounge and shuttle bay control room window frames so these areas may be lit. Torpedo tube masks that can be used with or without the clear kit pieces. Light masks for the “secondary hull” windows. 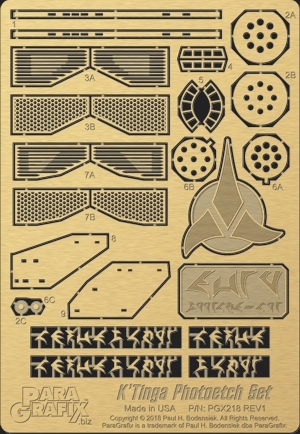 Klingon symbol and name plaque for the base. Three sets of Klingon lettering for custom text.